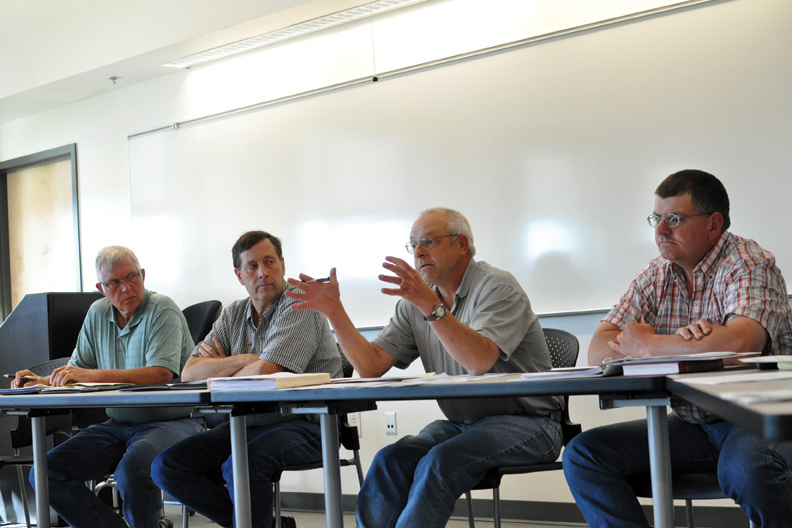 Rick Johnson, second from right, Colorado Northwestern Community College Board member, speaks during a special meeting Thursday about a proposed land transfer to the Craig Rural Fire Protection District for a fire training facility. The motion died for a lack of a second after about 15 community members voiced opposition to the proposed transfer. The Colorado Northwestern Community College Board allowed a proposal to transfer land to the Craig Rural Fire Protection District for a new training facility to fail during a special meeting tonight. A motion was made to accept a resolution, which would have granted the fire district a nearly 15-acre parcel upon which it would have built a training tower and live fire simulator, or the first phase of a second station. However, college board members declined to second the motion after about 15 people turned out to the meeting to oppose the land transfer. For more on this story, see Friday’s Craig Daily Press or visit http://www.craigdailypress.com.